The universal remote control accessory for iPhone, iPod touch and iPad. 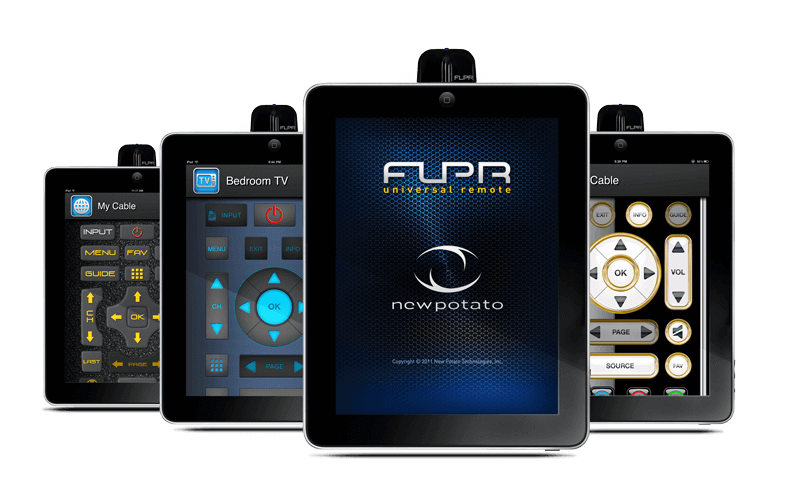 Taking control over your household electronics is a breeze using FLPR's programmable library. Transform your 30-pin iPhone, iPod touch and iPad into an universal remote control. Turn your iPhone, iPod Touch & iPad into a Programmable Universal Remote Control! FLPR Universal Remote Control converts your iPhone, iPod touch and iPad into a remote control to take charge of the electronic devices in your home. FLPR Programmable Universal Remote Control (URC) lets you flip through channels, power up the surround sound system, turn up the volume, dim the lights and close the blinds. FLPR Programmable Universal Remote Control (URC) replaces that cluttered mess of remotes on the coffee table. A snap to set up and simple to use, FLPR is a must have tech product. Real-time data is captured for later performance analysis. Real-time Chase Rider function lets you compete against your personal best or pace to your training goal. Mounting system securely protects your iPhone or iPod touch. Permanently sealed sensor unit is impervious to the elements. Single dual-mode sensor unit measures both wheel speed and pedal cadence. 2.4 GHz technology provides a reliable operation without the hassle and clutter of wires. What devices does FLPR programmable Universal Remote Control (URC) support? FLPR Programmable Universal Remote Control supports most leading electronics brands and contains over 65,000 device codes. A comprehensive list of devices supported can be found here: FLPR brands Supported. Literally hundreds of IR devices can be programmed and controlled using FLPR. To access saved devices, touch the grey function bar and scroll from left to right. Then touch the icon of the device that you would like to use and FLPR will switch to that device. Do I have to teach my FLPR Universal Remote Control all my remote commands? No. FLPR has an extensive database of over 65,000 complete remote control that work with most popular electronic devices. The database can be updated with a singe tap in the application. If a remote control is not in the current database, you will need the existing remote control to add your device to the application. Devices can be deleted by pressing and holding the icon of a device on the function bar. How do I get the FLPR Programmable Universal Remote Control application? You can download FLPR FREE from the Apple iTunes App Store either through iTunes or right from your iPhone or iPad using the integrated App Store utility. You can run the application without the infrared communication interface and see how it works and what devices it supports. However, in order to control actual devices, you will need to purchase and have the hardware to generate or receive infrared commands. Can I run the FLPR Universal Remote Control app without the hardware dongle? Sure, the app will allow you to check out all of the preprogrammed devices in our database and the see how the application works. You can setup the app in advance of purchasing the infrared communications interface and see that the devices in your home theater setup are fully supported. Is FLPR Programmable Universal Remote Control a learning remote? Yes, FLPR is definitely a learning remote. To teach FLPR new device codes, select Add Device and then Custom. Follow the onscreen steps, and your custom device will appear in the grey function bar. For more detailed instructions, please view the FLPR user guide. Will FLPR programmable Universal Remote Control (URC) drain my battery? NO! FLPR uses a negligible amount of power when it is connected. Only when you hit command keys does FLPR use a brief amount of power form your Apple iPhone, iPad, or iPod touch and then for such a brief moment (1/10 of a second) that the drain on the battery is not significant compared to the display energy usage, WiFi, Bluetooth or other services active on your device. Most conventional remotes will work for one to two years on a couple of disposable batteries and FLPR Programmable Universal Remote Control does not use any more energy than a typical remote control. Will FLPR programmable Universal Remote Control (URC) work with Apple iPad? Yes, FLPR will work with Apple iPad. For iPhone-based apps that run on iPad, you can either run them in an iPhone-sized screen or expanded to fit the full iPad screen. In the near future, we will be releasing a HD version for iPad that takes advantage of the larger screen area and provides some new cool features. What is FLPR's programmable Universal Remote Control (URC) maximum range? On average, FLPR Universal Remote Control can operate devices up to 45 feet away. This figure may be shorter or longer depending on several factors, including the remote protocol used. Some examples of situations in which the range might be shorter include a blocked or altered IR receiver, bright sunlight or certain types of fluorescent lighting, or incomplete custom device training (command key learning). My satellite box does not seem to respond to FLPR Remote Control (RC). Why? Your satellite receiver (i.e. DirectTV, Time Warner Scientific Atlantic ) is likely set to receive signals in RF mode, and if it's set to RF, it ignores the IR input. In your settings, you can set your receiver to receive IR signals. If an address setting is required by your set-top box, set it to remote address 1. Is there any way to program a pause or delay into a macro to allow a specific device time to warm up? Yes, FLPR Programmable Universal Remote Control includes support for this feature. To program a delay into a macro you are creating, tap the function bar. You will have the option of inserting a 1, 2, or 5 second delay in your macro sequence. Select your desired delay and continue programming your macro. For more detailed instructions, please consult the FLPR user guide. I want to create a series of button commands that will execute when I press one button. Can FLPR Universal Remote Control (URC) do that? Yes, this can be done using the FLPR MACRO feature. Macro keys store sequences of keys, and this sequence can come from any device or combination of devices. To get started creating a macro, touch the function bar, then select ADD and then NEW MACRO. Follow the on screen instructions to create your macro. For more detailed instructions, please consult the FLPR user guide. Does FLPR Programmable Universal Remote Control work with PlayStation3? The PS3 has no IR port, and the remote is Bluetooth™ only. However, there are several devices on the market that convert from IR to Bluetooth™, and FLPR supports these converters.